Start your crawl on State Street where you can sit in a booth, watch sports, and dine on some curds. As a bonus, they come with carrots and celery to start your crawl off with some greens! Head over to this longtime favorite spot in Madison next to try their amazing cheese curds…and you may have to cave in and order one of their irresistible burgers too! 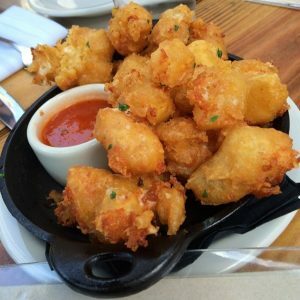 Just down the block, Nitty Gritty serves up some great cheese curds, in addition to beers and cocktails. If it happens to be your birthday, you’ll even receive a complimentary birthday beer! The next stop is The Old Fashioned, a Wisconsin-themed restaurant nestled on the Capitol Square. It’s said to house some of the best cheese curds in Madison. Try these with the paprika sauce and you may be hooked forever! Also on the Capitol Square, make sure to end your crawl at Graze for a modern, farm-to-table twist on the classic favorite!